Last week, a few professors from Beijing JiaoTong University visited the lab I’m doing research at. I was nervous the whole week as I knew I’d have to talk in Chinese to them. I hardly get speaking practice in South Africa, which I know is my worst ability in Chinese at the moment! I looked up a lot technical terms yesterday, which I didn’t even end up using when I talked. Yes, I’m nervous like that! Haha. 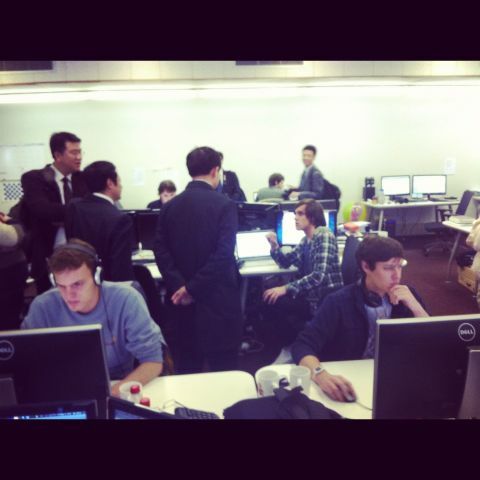 That’s me in the checkered top talking to the professors. You may notice the person in the forefront with earphones around his neck, that’s my twin brother (we both work in the same lab. He’s doing research into social networks and information overload). The conversation with the professors went quite smoothly in the end. I explained most of research, how I want to help learners Chinese learn characters better and how I think that radicals are an important of the Chinese script (they would know of course!). I left out some other stuff, like flashcards and spaced repetition, but I’m glad as even that in English is hard to explain to people! Woops! The top part should be ⺷! But here’s the interesting thing. I did a bit more research into this. The top component should actually be 羊 as this was part of the historic development of 姜. 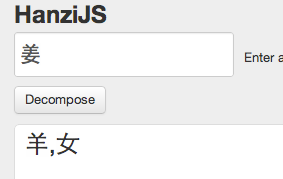 However, here’s the cool part, ⺷ is to 羊 as 氵 is to 水. Meaning that it is the form of the radical that is not stand-alone and only occurs fixed with a character. So how does one actually decode 姜? I asked this question on the Chinese Stack Exchange. Technically it should be ⺷ + 女, because when 羊 as a radical occurs at the top of the character, it should be ⺷. In my opinion, I think one should stick to showing 羊, because it works as familiar phonetic radical that aids in the pronunciation 姜 (Jiāng) as it has the same rhyme.